5 Best Board Books for Babies is a post by contributing author, Kathryn Beal. Hi everyone! My name is Kathryn, I’m Lise’s sister, and I’m so happy to be a new contributing author to MomLovesBaking. I live in Northern California with my husband and our adorable 6-month old baby (pictured above). I love to write about family, homemaking, and personal development. My first article for you is my current favorite children’s literature recommendations. Reading to kids is so important. It’s beneficial for language development, it can help little ones understand big ideas, and it’s a wonderful time to bond with your child. For the 0-6 month crowd, they aren’t going to understand much yet. At this stage, it’s about understanding the concept of books, letting them hear a variety of words, and interacting with your child. Also, even the littlest babies will pick up on your mood. If you’re dragging yourself through the book, he will notice and not enjoy it either. And that could affect his overall feelings about reading in the future. Find a way to make the time together fun for both of you. 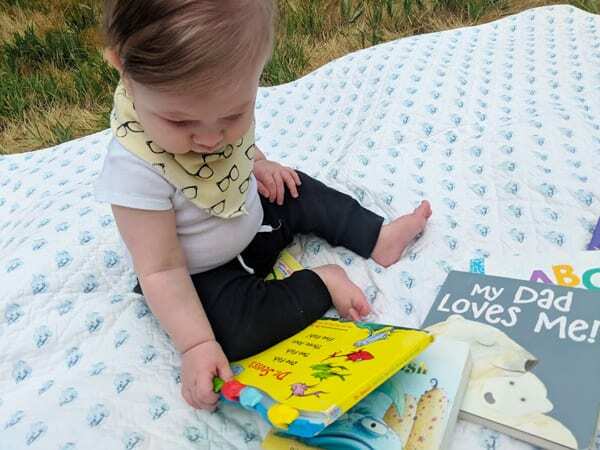 When I’m looking for a good book for my baby, I look for a relatively short length, sing-song sounds, and how enjoyable it is for both of us. One Fish, Two Fish, Three, Four, Five, Fish! My baby enjoys our reading time, but he doesn’t always have the longest attention span. Sometimes he just wants to grab the book and chew on it, and that’s ok! He’s just starting to understand what books are, so I’m happy if some of his favorite toys are books. It is nice to find books that are relatively short, though. 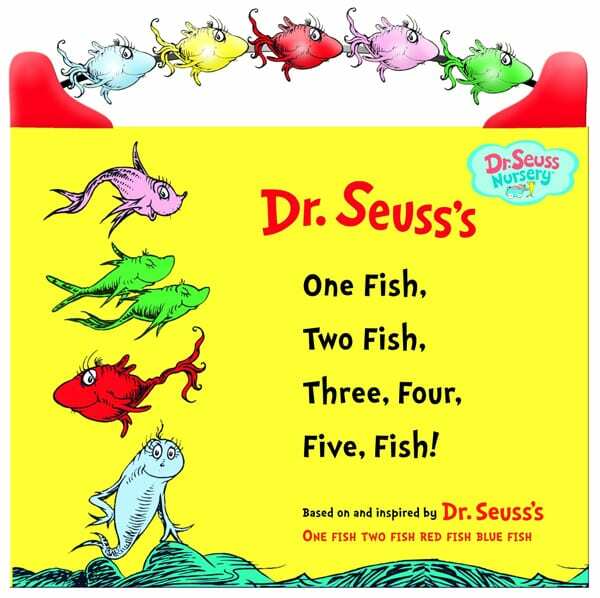 Dr. Seuss’s One Fish, Two Fish, Three, Four, Five Fish is perfect for this. We can read through the book quickly, and he can go about his baby business of eating all the things. 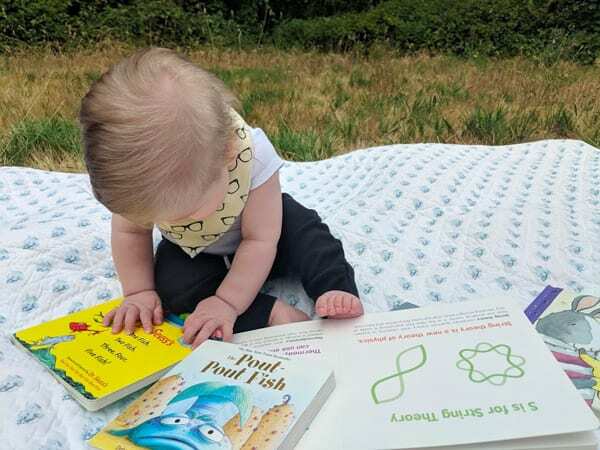 This book is only a few pages long, but my baby marvels at the contrast in the images, the fish show up brightly against the white background. He was grabbing at the pages early with this one. Once he starting teething, the plastic fish on top of the board book were a great texture for his sore gums. Add in the cute rhymes, and you’ve got one of the perfect books for babies. Another aspect that really holds my baby’s attention is rhyming, fun sounds, and a sing-song rhythm. The Pout-Pout Fish has all these and more. 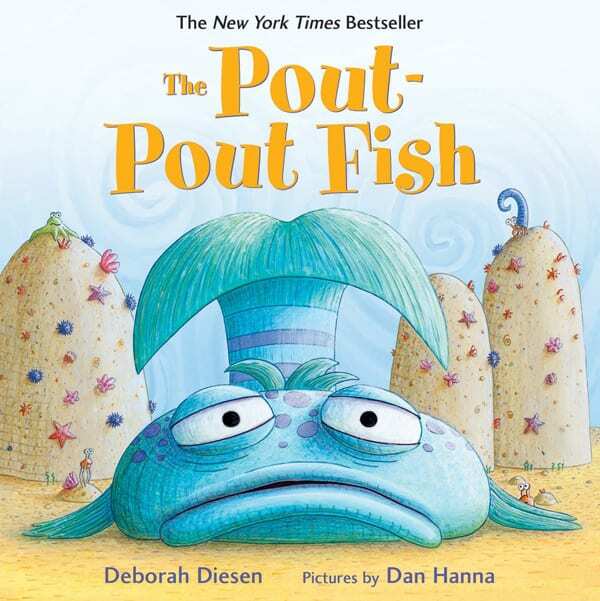 The story is about a grumpy fish who thinks being a pout-pout fish is just the way he is. His friends try to cheer him up, but nothing works until (spoiler alert!) a pretty fish comes along and smooches him! Then he becomes a kiss-kiss fish and happy as can be. As an adult, I find the story delightful, it reads like a song, and my baby stares at me wide-eyed when I say “Blub!” (a noise the pout-pout fish is fond of). It’s a tiny bit long, sometimes we have to skip to the ends, but overall, an excellent book for little ones. Much like Pout-Pout Fish, Dinosaur Dance! has great sounds. 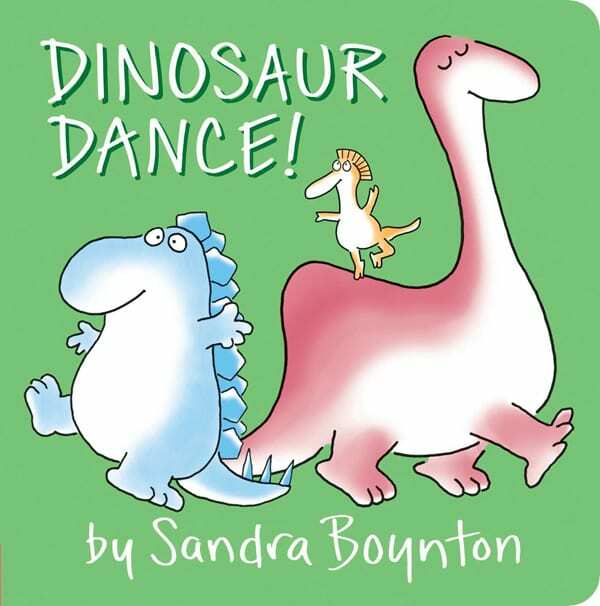 The book goes through different types of dinosaurs and the dances they do. I loved the alliteration and all the onomatopoeias; my baby loved when I demonstrated the dance moves. A fun book, especially for boys. 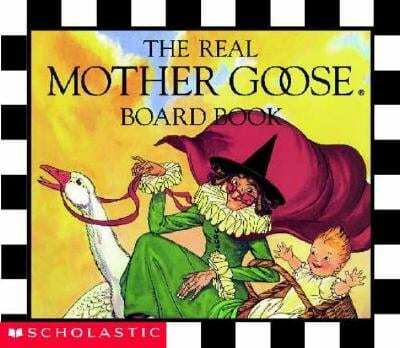 I enjoyed The Real Mother Goose poems when I was young, and my baby seems to like them too. The book has a variety of words and a charming rhythm to each little story. Also, each rhyme is episodic, so I can just read one or two, and then let baby nibble on the edges when he’s ready. Plus, it’s so special to share stories that have been passed down through the generations. There quite a few of these Peek-a-Boo books on the market, and we’ve checked out a few. They are fabulous books to start your baby with because they are interactive. 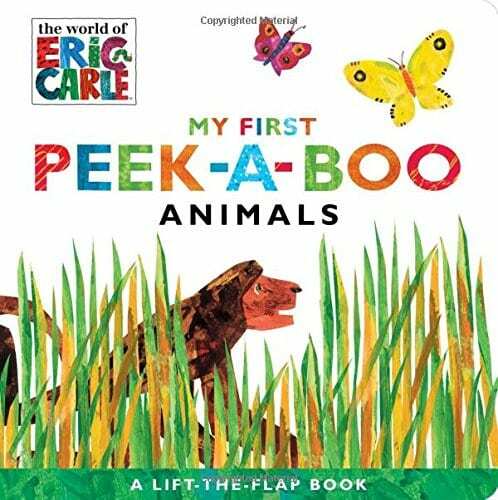 In My First Peek-a-Boo Animals, each page describes an animal, there is a flap covering the animal on the next page, and the peek-a-boo reveals the animal. Obviously, a newborn can’t guess the animal yet (he doesn’t even know what animals are yet! ), but you can go through the sequence with him. Start off by reading the description, then paraphrase what you read and ask your baby what he thinks. Give him a second to respond, then answer the question for him. Something like: “It says this animal is a big cat with yellow fur and stripes. Hmm, what could it be? Maybe it’s a tiger. What do you think? Let’s check. Peek-a-boo! It is a tiger!” It might sound silly to ask your baby questions he doesn’t know the answer to, but it’s through interactive conversations like this that your baby develops language. 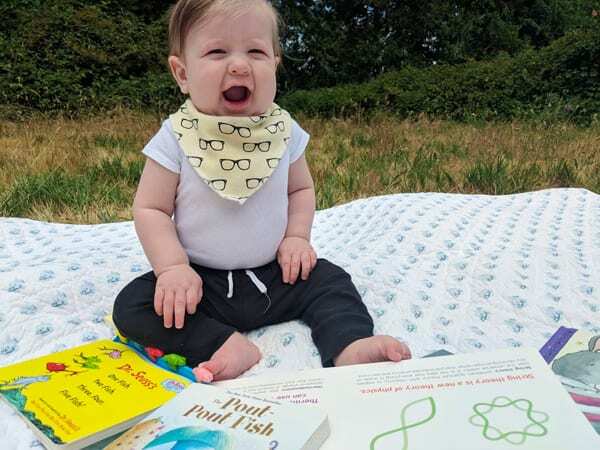 Those are my top five recommendations for baby board books! I hope you found this useful. What are your favorite baby books? If you like this post, would you consider pinning it to Pinterest? The image below was created especially for Pinterest. Will you pin it? Thank you and happy reading! Read more about Kathryn on our Meet the Team page. Great post Kathryn!! Baby looks so happy with his books! Love Dr. Seuss &, Eric Carle for the Grands:) Will have to try the other books too, Pout, Pout Fish looks fun!